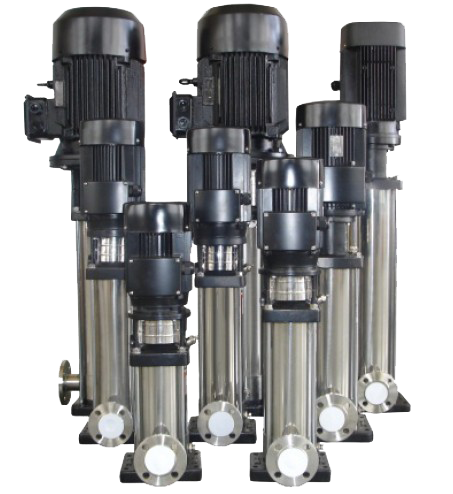 "PEW" Multistage Vertical Centrifugal Pumps (PW series) are non self priming with inline design for ease of installation in constricted spaces. The suction and delivery ports are of same size and in the same horizontal plane. The mechanical seal and bearings are lubricated by the pumped liquid. All components like impellers, diffuser and shaft are made of corrosion resistant stainless steel and designed to deliver the best possible hydraulic efficiency. Excessive Axial thrust is balanced by assembling the pump stages with equal number of opposed impellers. Balancing of axial thrust allows the use of standard flange mounted motors without special bearings. Working pressure on mechanical seal reduces to half, due to opposed impellers. The shaft is well supported by bush bearings ensuring noiseless operation. Good quality raw materials & hydraulic design facilitate longer life with high efficiency. The in-line port design and compact footprint of these pumps allows for a clean installation. All models feature a shaft seal that can be replaced easily without the need to disassemble the entire pump. Pumps can be used for clear, nonabrasive, nonflammable liquids compatible with pump component materials.